What Types of Training Do You Offer? How Do They Differ? 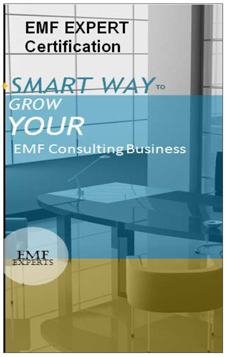 The EMF Experts "Ready When You Are" Courses, are all about the convenience of self-guided webinars that are designed to give you the info you need quickly and inexpensively, with easily digested bite-size classes that also enable you to earn (optional) financial and academic credit towards EMF Consultant Certification training anytime within a year. The LIVE EMF Consultant Certification Course, is comprised of both self-guided and instructor-led classes designed to provide well respected credentials as a Certified EMF Consultant, highly qualified in EMF detection and protection as it applies to various areas of EMF business. OUR CERTIFIED EMF PROFESSIONAL TRAINING OPENS DOORS! What can I Expect from EMF Expert Training? Here's a brief video introduction to EMF Expert Consultant Certification Training from your instructor, Professional Electrical Engineer, Chris Young, at EMF Experts' "Mission Control" where the live-online training webinars are held, to help you find out what to expect at the training and from the certification. Enjoy meeting your instructor in this brief video invitation, or jump directly to the 30 minute training overview video. When does my EMF Consultant Certification training actually start? When I enroll? Yes, your training begins whenever you are ready to enroll. It begins with self-guided classes (Training Component One) that have been designed to enable you to begin right away, and proceed at your own learning pace until the next upcoming Live training start date (Training Component Two). Once the Live instructor-taught classes begin the training presentations occur on a fixed schedule (refer to the course dates/times of your particular enrollment), and the requisite field assignments, research, reports etc are due as laid out in each class. I enroll for my training dates ... What happens next? Upon receipt of payment in the EMF Expert Classroom you will be automatically directed to your Component One Classes, which are the self-guided classes. There you will see the Getting Started Guide, which will walk you step by step through the Classroom and Class Content so you can get the most from your training right from the beginning. You can self select the classes you wish to begin with simply by clicking on them, which will take you to the classroom for that class. The Classroom itself is very user friendly and intuitive and you will be off to a good start within minutes. TIP: Remember to click 'Completed' when you have finished a lesson, to ensure you receive academic credit for having completed that portion of the training. How Do I Know if My Computer is Adequate for Handling the Training - i.e. live online classes, streaming video etc? You are welcome to participate in the free self-guided video classes that you find offered in the EMF Experts Classrooms to take your computer for a 'test drive' on our learning platform. These classes serve to enable you to become acquainted with online learning platforms using streaming videos, downloads, quizzes, student comments, etc that your computer will need to perform for you to participate in the classes. The learning platform is very user friendly, intuitive to navigate, and designed to accommodate almost any computer, laptop, iPad or other online device. The free classes that are offered vary from time to time and not all are available all the time, so check back to see if new ones have been added. The course content is delivered by two methods. The first is the on-line in both a self-guided, self-paced video training (with download reference and support material included) - this is Component One of the training course. These self guided classes are available 24/7 and Ideally they should be all completed before the Live Webinar training begins since they form foundational information that the upcoming Live Webinar training will build upon. The Live Webinars, which form Component Two of the training course, provide 12 Live Instructor taught Webinars each with live student instructor interaction, live student Q&A, as course quiz's and field assignments completed outside of the webinars. There is plenty of email contact with the instructor -- Chris Young Professional Electrical Engineer -- and in this way each assignment receives detailed attention, and feedback.to assist the learning process. Other experts in their field are brought in to present topics during this course, with a focus on health research as it relates to EMF. The live presentation moves at a brisk pace, and so Class Notes (pdf) and a recorded video of the live class are available for student review following each class. This training features personalized one-on-one mentoring in order to meet each student where they are in his/her training comprehension and in their individual EMF situation. Please refer to the student testimonials for more info on the firsthand training experience, and to read what our Grads would like anyone considering this training to know. How much additional time should I expect to complete assignments or study the material, in addition to the time spent attending the live webinar classes? The self-guided training components are self-paced and designed to be stop/go friendly so you can complete them at your convenience. If you are also enrolled in the EMF Consultant Certification Training course you will naturally want to have them completed by the live training component start-date. When the live training begins there will be assignments and tests required to obtain certification. The time spent preparing homework and studying depends entirely on you. To obtain certification passing grade you will receive homework assignments that count towards your score on your ‘progress report card’. At the start of the course you will receive the grading procedures, and each class you will receive the required assignments and their score value, which will be used to count towards your EMF Consultant Certification passing grade. We recommend completing all assignments on time to get the most from this certification training, which builds quickly, one class upon the next, and this typically means dedicating an additional two hours of homework time per class to stay abreast. Additionally, the written class material is very extensive and you will receive over 60 pages of notes following each class, mainly to provide you with more additional informative material than can be presented in a 1.5 hr class. This material is intended to serve you with more related in-depth information on a specific area of interest to you. It is not required that you read all the class notes, only what you wish to specialize in. Or to study/review those notes that will be tested in the periodic open-book tests. Do I need to purchase any equipment/tools needed before the course begins? No you do not need to buy any equipment. Meters, books etc. will be recommended for purchase during the course at the appropriate time for their training use. The EMF Metering training (Class 9) will provide you with information to enable you to select a meter for your specific intended use. In the course of training, you may find that if you already own a meter it will be suitable. 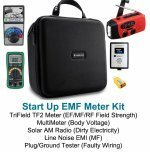 What should I budget for EMF Meters that will be required for this training? Basic EMF Meters typically cost between $150 - $400 each, and you will need to measure electrical/magnetic fields, and wireless radio/microwave fields. You will learn the range in price, features, and other purchase options to consider when it comes to consumer grade meters, including meters for other applications such as measuring dirty electricity and body voltage. In addition you will learn about a wider assortment of more expensive (more accurate, better range, more convenient etc) professional grade meters. While we recommend budgeting $350 - $400 for meters for two EMF 'work horse' meters, you may find during the course of training that this is less, or more, than you need or want to spend. There is a meter for every budget however, like most things since you get what you pay for, we recommend the best quality you can afford. The class will teach you everything you need to know about your meter options, as well as teaching you how to get the best performance from meters you may already own. What happens when I miss a webinar class? Is there a way to make it up or to catch up? This is a live instructor-led class designed to offer you distinct advantages so it is important to participate in the live presentation in order to benefit from such things as being able to ask questions and keep current with fast changing news. Since it is presented in-person it will contain more current up-to-the-minute information than a previously recorded version could. The live presentation will also typically include other related information than that contained in the class notes that are provided to you at the end of every class. That said, each class has been pre-recorded, and (by special arrangements only) we can make it available to you online for a 48 hour period, in cases where it is absolutely necessary to miss a live class. The recorded live classes are particularly helpful for international students, due to the time zone difference, and this has never been an obstacle to graduating on time. We would never want you to be unhappy! We work very hard to make sure the course delivers what you want to learn. And If you need to reschedule your live training we will work hard with you to secure a future live course date for you. For more details about our customer satisfaction policy please see the Certification Training Info Packet, which you can request below, which will tell you how this works and much more about the training we offer. 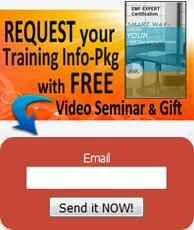 After my training ends will I have access to the training videos and class material? During the course you will have ample opportunity to view videos and download training material as each class progresses. When the course ends - complete with graduation ceremonies, awards and more -- the online classroom is closed and no access it permitted, and you graduate with a very large organized library of training material for your future reference. You will be able to keep in touch with the instructor, and to have ongoing continuing education to keep your training current. Will I be able to communicate with my fellow classmates in the Classroom? During the course each classroom has a Discussion and Comment section where students can post ideas and thoughts that contribute to that class topic, and posts are limited to the subjects under discussion. However participation in the discussion/comment feature is optional, as many students prefer to remain unidentified and simply attend to receive the training education. In the last class graduation ceremonies are held online and students (who has given their permission to be identified) are Introduced to the class as they receive their awards. Following graduation, all students who opt to be included in the EMF Professional Directory as a Certified EMF Expert Consultant will be able to be in touch with each other, and will recognize each other by their date of certification. This is especially helpful for those graduates interested in networking, however the directory itself is intended to provide a means for potential clients to locate consultants. I have a Million questions before the course has even started. How do you handle student questions? It is natural for students to have many EMF Consultant Training questions. Start a list of all the questions as they come to you, during the course we’ll have lots of ground to cover on "millions" of topics and your question is very likely to be covered in detail. So, rather than give incomplete responses by email (within the limits of email), be assured your "very good question" will certainly be answered during the upcoming training course. Prior to every class each student will receive by email the list of topics that will be covered in the next upcoming class, and there will be a live Q & A dealing with those topics following that class. Keep your list of questions handy and be sure to refer to it after the live presentation, when the training content is fresh in your mind, to make sure that you have gotten all your questions completely answered. If you have a question that is too personal to ask during the live Q & A you are invited to send it to the instructor 'privately' (one-on-one) on the live eLearning platform with your request for a private email response. Naturally if you have an urgent personal EMF situation you can also request a phone conversation anytime during the course. If you are not an enrolled student, you are welcome to ask your EMF Detection or Protection related question by taking advantage of the Ask and EMF Expert service we offer. Have More EMF Consultant Training Questions? Quick EMF Consultant Training Questions are found on this page to give you an overview of our training and give you a good place to get started. Check these page for more Detailed EMF Consultant Certification Questions or EMF Business Building Questions.